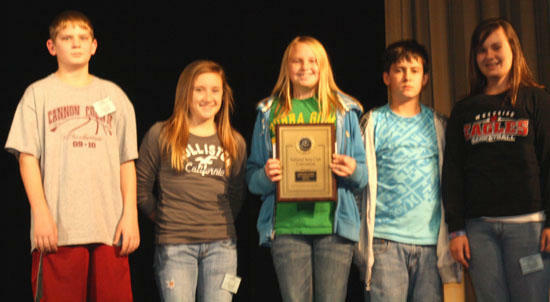 The West Side Beta Club captured a second-place win in the Living Literature Competition. Their entry was one of 37. They will now go on to the National Jr. Beta Convention in Louisville, Kentucky, June 26-29, 2010. Thank you to Dr. Deason and all our Beta students and parents for a job well done! Pictured: Jacob Nave - the Boy, Samantha Lehew - mother Homily, Autumn King - daughter Arriety, Jake Burdick - father Pod, and Elleana Sissom - Great-Aunt Sophie.